AN AER LINGUS flight was forced to return to Dublin Airport this morning amid fears that a hare had been sucked into one of the jet’s engines during take-off. Flight EI-582 departed Dublin at 8.15am and was bound for Malaga in Spain with 287 passengers on board. Soon after take-off the crew informed air traffic controllers that they had struck two “rabbits or hares” on departure. An inspection of the runway was carried out and at least one hare carcass was discovered. It was feared that a second dead hare may have been sucked into one of the Airbus A330-300’s engines. The crew continued their journey for a time but turned around about 30 minutes later just north of the French coast. The flight returned to Dublin for a safe landing. The crew did not declare and emergency but airport crews were standing by for the flights return. Engineers were also waiting to inspect the aircraft while a replacement plane will take the passengers onto their destination later this afternoon. Flight EI582 departed Dublin Airport this morning, en route to Malaga with 287 guests on board. The aircraft turned back less than one hour into the flight, due to a technical issue, and landed safely at Dublin at 9.52am. “Guests disembarked normally and will be flown to Malaga this afternoon on a replacement aircraft. We apologise to our guests for this disruption to their travel plans,” the company said. Email “An Aer Lingus flight has returned to Dublin after hitting a hare on take-off”. 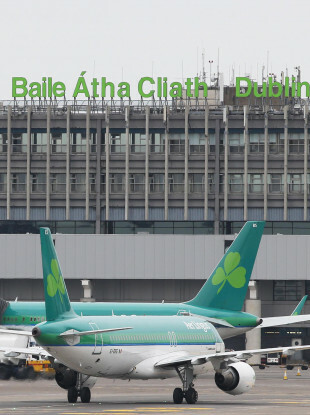 Feedback on “An Aer Lingus flight has returned to Dublin after hitting a hare on take-off”.